With the intention to let immigration authorities grant L-1 B visas easily, the Government of US has announced new guidelines to identify the workers eligible for the L-1B visas. 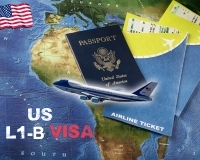 US L-1B visa is for skilled workers who possess specialized knowledge and are transferred to the USA within their firm. USCIS (United States Citizenship and Immigration Services) stated that the guidelines were announced to prop up consistency and efficiency in granting L-1B visas. Additionally, the new guidelines state immigration authorities to be flexible in extending the term of prevailing L-1B visas.